Pennsylvania could avoid a “devastating and permanent blow” to its economy and environment if it considers the ways other states have helped bail out their own failing nuclear plants, according to a long-awaited legislative analysis. The 42-page report published Thursday by Pennsylvania’s bipartisan Nuclear Energy Caucus was nearly two years in the making. It outlines ways the state could aid its nuclear fleet, including by putting a price on carbon. Two of Pennsylvania’s five nuclear plants are soon set to close prematurely. Last year, Exelon said it would shutter its Three Mile Island plant near Harrisburg in 2019. Earlier this year, FirstEnergy announced it would retire its Beaver Valley plant ahead of schedule, in 2021. The early closures are part of a broader trend across the U.S. as the industry has struggled amid slowing demand for electricity and competition from cheaper natural gas and renewables. In recent years, other states — including New York, Illinois, New Jersey and Connecticut — have used various, controversial mechanisms to give billions of dollars to prop up their ailing nuclear plants by recognizing them as a source of carbon-free power. Sen. Ryan Aument (R- Lancaster) co-chairs Pennsylvania’s Nuclear Energy Caucus. 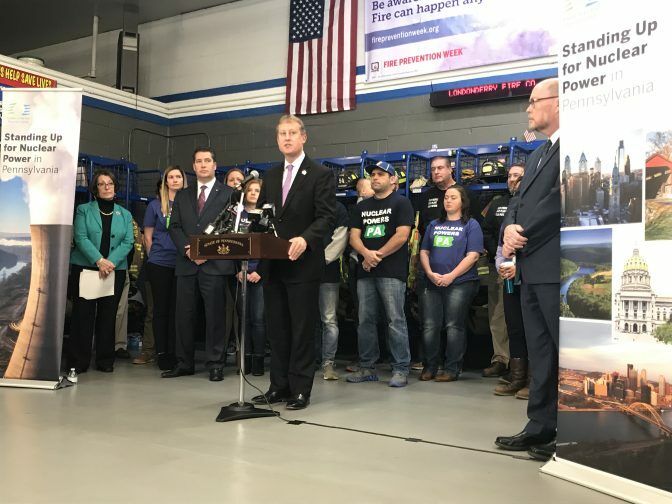 At a news conference in Middletown, flanked by hundreds of nuclear industry workers, caucus co-chair Sen. Ryan Aument (R-Lancaster) said when he first began learning about the challenges facing the nuclear industry, he was more concerned about the economic impact of lost jobs at the nearby Three Mile Island plant. He now views climate change as the dominant reason to keep the plants online. The nuclear caucus suggests a $15 per ton price on carbon as the best “long-term solution,” but says that would not rescue Pennsylvania plants facing imminent closure because it would take too long to implement. In the short term, the report suggests altering Pennsylvania’s Alternative Energy Portfolio Standard – a 2004 law requiring utilities to purchase a certain percentage of electricity from clean sources. Those clean sources do not include nuclear power. The report also suggests following other states’ lead and creating what’s known as zero emission credits (ZECs), which effectively broaden the definition of clean power and recognize nuclear for its carbon-free emissions. Mark Szybist, a senior attorney for the Natural Resources Defense Council, called the report “an important starting point for discussing a clean energy transition in Pennsylvania,” but said it falls short of the broad range of policies the state really needs to address climate change. “If state leaders decide to provide subsidies to nuclear plants, they must also enact policies to accelerate energy efficiency and solar and wind power, and take critical steps to ensure fairness for consumers, workers and communities,” Szybist said. The nuclear industry and its supporters argue the status quo is flawed, because it’s designed around delivering the cheapest megawatt-hour of electricity in the next hour, and it fails to consider the valuable long-term assets nuclear power brings to the table — like carbon-free emissions, fuel-supply diversity, and reliability. Critics argue the bailouts distort the competitive wholesale electricity marketplace, and say that nuclear power should not be lumped in with clean, renewable energy — noting the emissions from mining uranium and the fact that the U.S. lacks a plan for disposing of its radioactive nuclear waste. Opposition is coming from some major players, including Pennsylvania’s natural gas industry, which has been steadily growing its share of electric power generation, and the AARP, which argues the bailouts hurt ratepayers. In an op-ed published Thursday, Eric Epstein, chairman of the nuclear watchdog group TMI Alert, and Maureen Mulligan, president of Sustainable Futures Communications LLC, argue that aiding struggling nuclear plants undermines U.S. energy independence. The Federal Energy Regulatory Commission is working out how to recognize states’ rights to prioritize certain resources, like nuclear, while also protecting the integrity of the marketplace. PJM, the regional grid operator for the Mid-Atlantic submitted a filing at FERC’s direction earlier this year with a plan to try to do that. 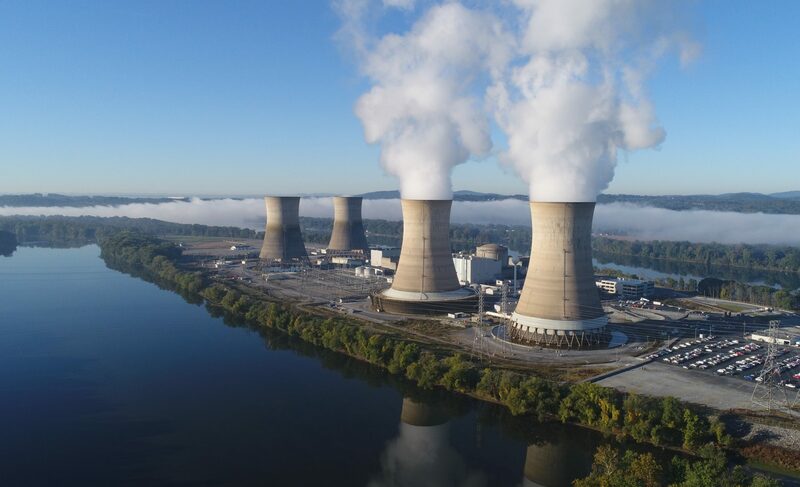 Despite concerns raised by nuclear industry advocates, PJM’s senior vice president for operations and markets Stu Bresler said Pennsylvania’s nuclear retirements pose no threat to the reliability of the grid. Gov. Tom Wolf has been awaiting the Nuclear Energy Caucus’ report and is looking forward to reviewing it, said his spokesman J.J. Abbott.